Anteaters are suborder Vermilingua mammals that are related to armadillos and sloths. They differ from armadillos and sloths in one major way, however; anteaters are devoid of teeth, but armadillos are equipped with plenty of them. Sloths have them, too. The anteater realm is made up of four species. Since anteaters are devoid of teeth, they're unable to chew. However, the upper portions within their mouths are extremely tough in texture. When they eat, they press their tongues against these tough portions. This action crumbles their food -- similar to chewing. When anteaters are busy feeding, they frequently ingest tiny pebbles and sand as they do so. While seemingly strange, this actually has a useful result, as the pebbles and sand conveniently assist in pounding down food once it's inside of the anteaters' bellies. As their common moniker shows, ants are an extremely important component in anteater feeding. Ants aren't the only things they eat, however -- they also regularly dine on termites. The sizes of the insects they consume often depend on the type of anteater they are, too. The biggest anteaters -- giant anteaters -- generally opt to eat bigger ants. As savvy hunters, anteaters tend to steer clear of ants that have sizable jaws -- they can bite. Many anteaters are sizable creatures. Mature giant anteaters (Mymecophaga tridactyla) can sometimes weigh upward of 140 pounds. It isn't unheard of for giant anteaters to put away a maximum of 60,000 ants in the span of 24 hours. Tinier specimens are serious about ant eating too. They frequently consume approximately 9,000 of the insects in a single day. While countless species of animals utilize their teeth to grab their prey, anteaters clearly don't have that option. Luckily for them, they possess long and viscous tongues that are extremely swift to handle their food-trapping needs. When anteaters spot ants, they simply push their tongues in the insects' direction. When they look for food, they generally do so around anthills. 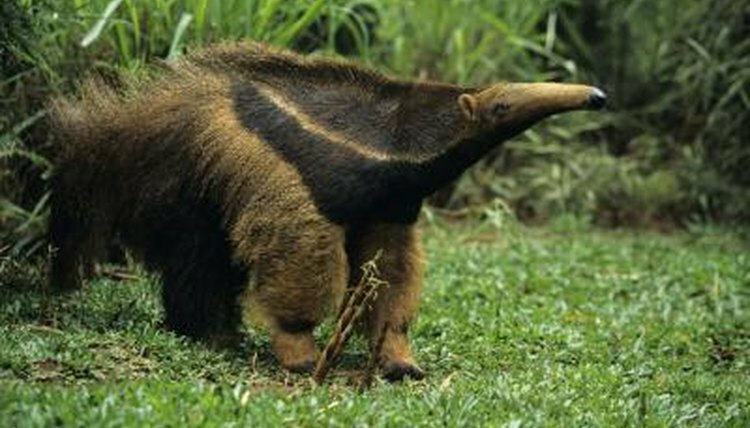 Anteaters previously were classified as part of the order Edentata, along with armadillos and sloths. Edentata translates to "without teeth," which was only accurate for anteaters and not for the other two. Because of that confusion, they're now all part of the superorder Xenarthra, which translates to "unusual joints," a reference to their atypical backbone joints. What Is a Toucan's Prey? What Kind of Ants Do Thorny Devil Lizards Eat?